Stockdale’s try helped the hosts to a 16-9 victory over the world number one All Blacks. Ireland's Jacob Stockdale scores a try during the Autumn International match at the Aviva Stadium, Dublin. Niall Carson/PA Wire. Ireland's CJ Stander celebrates after victory over New Zealand in the Autumn International match at the Aviva Stadium, Dublin. Brian Lawless/PA Wire. New Zealand players after defeat to Ireland in the Autumn International match at the Aviva Stadium, Dublin. Brian Lawless/PA Wire. Jonathan Sexton - 9: Clearly very pumped for anything that came his way, his game-changing switch plays were as good as his brave tackling and goal-kicking. Ireland's Bundee Aki celebrates after victory over New Zealand in the Autumn International match at the Aviva Stadium, Dublin. Brian Lawless/PA Wire. Jacob Stockdale’s 12th try in 14 Tests put Ireland on top of the world in everything but the rankings as Joe Schmidt’s men defeated New Zealand 16-9 in Dublin. Ulster powerhouse Stockdale’s stunningly-crafted score helped Ireland register just their second win over New Zealand, backing up the 40-29 triumph from 2016 in Chicago. New Zealand will retain their world number one status despite losing to second-ranked Ireland – but All Blacks head coach Steve Hansen insisted before this clash that the winner would swipe the global bragging rights. By that logic, Ireland have earned the right to call themselves the world’s best. And after passing this unremitting challenge against the back-to-back world champions, few could argue if they do. This was boss Schmidt’s men at their gritty, canny and brutal best. All Blacks chief Hansen warned his side not to fall for any of Schmidt’s special moves, but that’s exactly what happened for Stockdale’s winning score. Ireland met the Haka by taking a collective stride forward, inciting a guttural roar the like of which the Aviva Stadium has rarely equalled. No backward step. Johnny Sexton and Beauden Barrett traded penalties before Ireland besieged the All Black line. The unusually ill-disciplined New Zealand kept on leaking penalties, so Ireland kept on pinning in their visitors. Sexton eschewed a facile three-pointer for a penalty line-out but CJ Stander was held up over the line as Ireland punched a midfield hole. 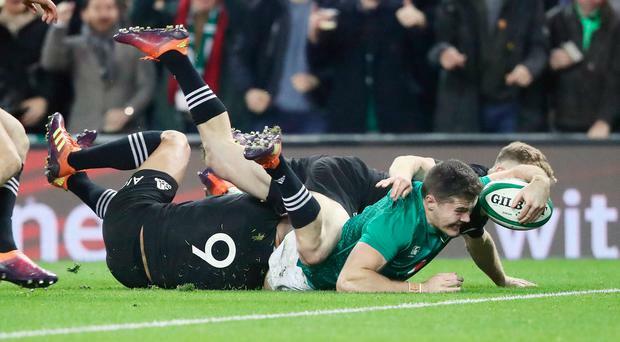 Schmidt’s men battered the All Blacks in the resulting five-metre scrum, and then Rob Kearney saw a try awarded to him on the field – then chalked off after review. The fit-again full-back rose highest to Sexton’s bomb and wriggled over the whitewash, only to be judged to have knocked on in the act of grounding. Ireland had to settle for Sexton’s second penalty, whereupon New Zealand strode up the other end of the field – and Barrett dropped a goal to level the scores again. Ireland’s pack pulverised New Zealand at the scrum again, but had to content themselves with another Sexton penalty. Kieran Read’s shock knock-on handed Stockdale a huge reprieve to open the second half. Stockdale showed his inexperience in attempting a crude chip over the towering number eight. Read charged down the effort and had the tryline at his mercy despite a 40-metre run-in – but bungled the ball forwards. Stockdale’s big let-off turned into total redemption just moments later, when he stunned the visitors with a try of the highest class. Sexton switched with Bundee Aki, the Connacht battering ram fired a bullet pass across the ruck – and Stockdale set off through the stunned New Zealand defence. One deep punt later and he outpaced the cover to the loose ball and dotted down, with Sexton’s conversion making it 16-6. Ireland rode their luck when Kearney avoided a card for colliding with the airborne Rieko Ioane, before Peter O’Mahony swiped a loose ball from under Ben Smith’s nose. Smith fully expected to collect Barrett’s smart grubber and score, only for O’Mahony to sneak the ball away. Somehow Ireland kept holding on. Barrett’s second penalty of the night closed the gap to seven points with 10 minutes to play. New Zealand pressed and pressed, but still Ireland held on. And when Brodie Retallick knocked on in overtime, the victory was theirs.